Under the auspices of the UN, a new global sustainability initiative is taking shape. 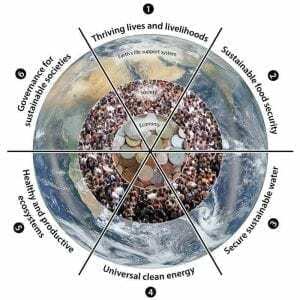 With the UN Commission on Sustainable Development (CSD) having wrapped up its work on September 20th and the Millennium Development Goals (MDGs) set to expire in 2015, political leaders and policy makers are crafting a new development framework based on sustainability. In total, there are eight MDGs, 21 specific targets and more than 60 indicators. We have seen progress on seven of eight MDGs including poverty, hunger, education, child mortality, HIV, water and sanitation. But we have not seen the progress we would like to see on gender equality, particularly as it relates to schooling. One of the outstanding accomplishments of the MDGs involve cutting the number of people who live in extreme poverty by half. The MDGs have augured unprecedented efforts and significant progress in an effort to address the needs of the world’s poorest people. Overall they have been remarkably successful, however, despite considerable progress, some of the goals are unlikely to be realized by 2015. In addition to assessing the MDGs, leaders and policy makers are now thinking about what comes next. A September 2013 special report from a consortium of organizations led by CIGI and the Korea Development Institute (KDI) reviews a number of options for the post 2015 successors to the MDGs. The report concludes the global community must build on the current MDGs and move beyond meeting basic human needs. In addition to emphasizing the role of adolescent girls, the report supports the creation of inclusive sustainable development goals. In June 2012, countries at the Conference on Sustainable Development known as the Rio+20 agreed that levels of environmental protection are insufficient. They put forth the basic outline of SDGs and member states agreed to establish an “inclusive and transparent intergovernmental process open to all stakeholders, with a view to developing global sustainable development goals”. They agreed to build upon the MDGs and converge with the post 2015 development agenda that included a process to develop a set of SDGs. A number of work streams were commenced to elaborate on the proposed SDGs. The outcome document also mandated the creation of an inter-governmental Open Working Group, that will submit a report to the 68th session of the General Assembly containing a proposal for sustainable development goals for consideration and appropriate action. SDG Open Working Group had its first session in March 2013, and will run through a total of eight sessions concluding in February 2014. To ensure the prioritization of sustainable development at the highest levels of government, members at Rio+20 also agreed to change from the CSD, which was formed after the 1992 Earth Summit in Rio de Janeiro, to the High-level Political Forum (HLPF) on sustainable development. Ensuring the appropriate consideration of new and emerging sustainable development challenges. To advance the work of the HLPF, the UN General Secretary said he will create a Scientific Advisory Board. The HLPF will bring together government leaders every four years as part of the General Assembly to address the challenges of sustainable development. It will also meet annually at the ministerial level, as part of the UN Economic and Social Council (ECOSOC). In 2016, the HLPF will review implementation of sustainable development by all countries and the UN system, in order to bring about accountability and a focus on action. On the morning of September, 25, 2013, the UN General Assembly officially approved the inclusion of SDGs, including environmental sustainability, to replace MDGs. This measure passed thanks in part to a new coalition between poorer countries and the U.S., Europe, Japan and other nations. Over the next year there will be “substantive discussions” from various working groups, then a debate will occur at next Semptember’s session of the General Assembly and the final goals will be released a year later. SDGs offer a constructive follow up for a post 2015 development agenda. By replacing MDGs with SDG’s we can continue to reduce poverty while building a sustainable economy. This approach not only addresses the needs of those most in need, it confronts the overarching issue of climate change and environmental degradation which undermines development and threatens civilization itself.